Conformational characterization of single - and -epimers of galactosamine in solution still remains an intriguing task because of their flexibility and ability to interconvert. This difficulty was circumvented by recording several snapshots of the epimerization process by means of fast ESI vaporization of a galactosamineHCl sample solution at different times. 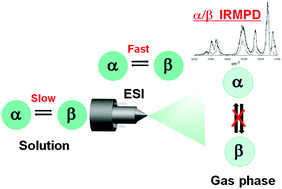 Consequently, the so generated gaseous mixtures were spectroscopically investigated and the specific conformational features of both - and -epimers were assigned, despite the overlapping of several IR signals. Interestingly, from a comparison with time-resolved H-1-NMR data obtained for the same solutions, the catalyzing effect of the applied ESI technique in the anomerization process clearly emerges. Finally, the experimental data were supported using both the Density Functional Theory (DFT) and Block-Localized Wavefunction (BLW) approaches : the latter method was applied here for the first time for the investigation of charged species.